I woke up to hear it raining last night and breathed a huge sigh of relief. My, did we need that rain! Gardeners usually celebrate rainy days, and in the process tick a lot of people off who have been cheated of picnics and sporting events, but there comes a point when plants just need more water than they can get with any irrigation system. Everything was looking a mite crisp out there, and now we might just get by for a while. I have to say, however, that I’m glad it didn’t rain yesterday, since I spent the day at Monticello enjoying their Heritage Harvest Festival. More about that later when I have processed all the great talks I heard, but although I skipped veggie gardener Pat Brodowski’s wonderful garden tour this year, I did wander about and look at (and photograph) the plants they’re growing in tribute to Thomas Jefferson’s obsession with acquiring the new and fascinating in horticulture, and bringing the best of food to his table. The picture above is of a cucuzzi squash (really an edible gourd): at least I’m 97% sure that’s what it is and told a bunch of confused visitors so (the perils of wearing a Grow It Eat It hat and looking like you know what you’re talking about). The presumed cucuzzis were at the end of a sort of allee of hyacinth beans, a beautiful effect. Everything was laid out well, and intelligently chosen, and healthy despite the nasty summer… well, they do have staff, though thank history not the kind of staff Jefferson had working his garden. I was particularly jealous of the sea kale. Sea kale (Crambe maritima) is a perennial member of the Brassica family that grows wild on the northwestern coasts of Europe. Traditionally its new spring shoots are blanched by covering with beach shingle or with the kind of pot you see in the photo, and eaten like asparagus. I really want to grow it, and I tried this year, but this is what my plants looked like just before I pulled them out in early September. They were doing fine (okay, anyway) until I inadvisedly took the row covers off, and then the harlequin bugs descended and destroyed. 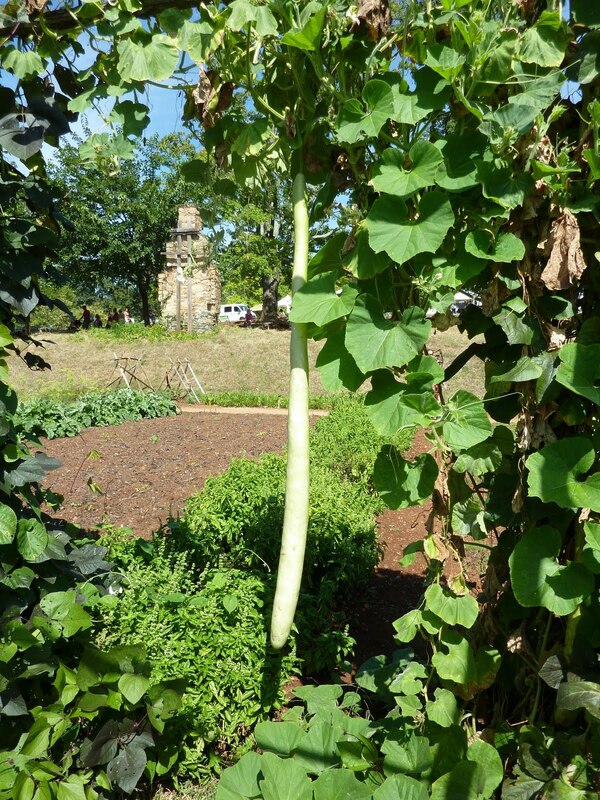 The Monticello garden had harlequins; they were eating horseradish and ignoring the sea kale and the newly added fall cabbages. At our demo garden they enjoy horseradish too (in fact they covered the plants so thoroughly we had to cut off all the leaves) but they do not leave the other plants alone. 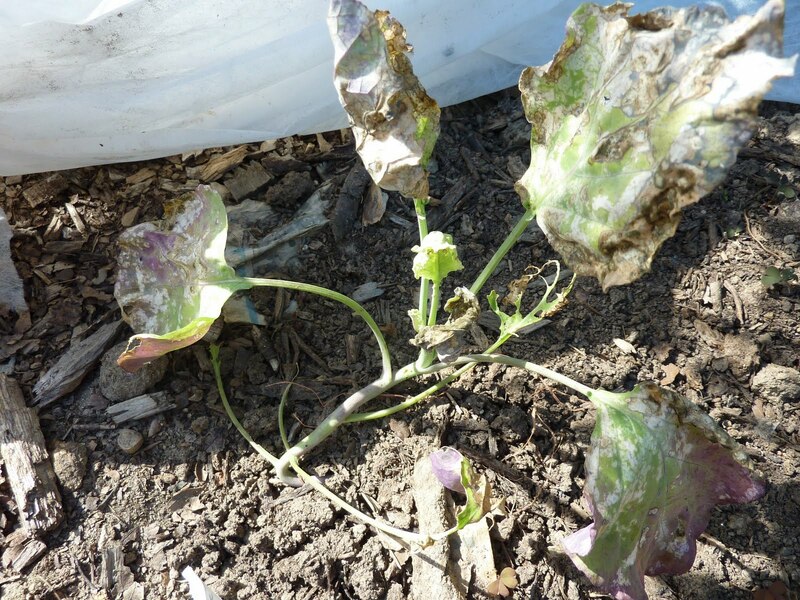 We’ve had to encase every fall brassica we have in row cover (will show you that in another post). Maybe I need to plant a lot more horseradish? I guess I’m destined to attempt sea kale over and over, learning a new lesson each time (which would be fine with most veggie garden annuals but is frustrating with a perennial grown from expensive seeds). I did learn how to germinate it this year, which I totally failed at last year. 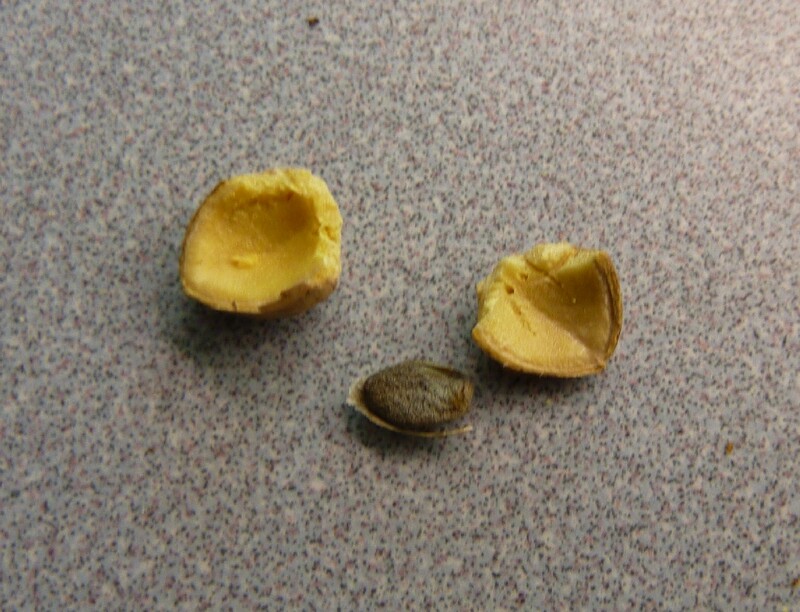 The secret is to remove or at least make a hole in the corky outer shell of the seed. 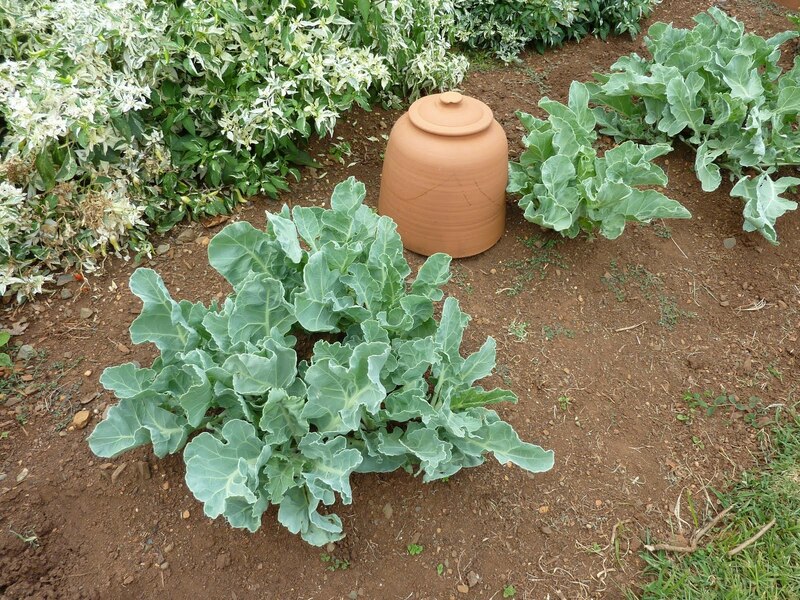 Then it sprouts as easily as any other cabbage family plant, though it grows more slowly. Perhaps next year I will manage to protect the plants from insects, and then forget to mulch them enough to survive the winter – as long as it’s a new mistake! wow, I didn't expect the seed to have a hard outer shell like that. Better luck next year – it sure looks like (like it could be) a winner! Thank you for sharing your finding. As I type I am removing the corky exterior of the seed. Do you still need to stratify the seed? No, it germinated just fine after that. Good luck! Thanks for posting this. I plan on growing Sea Kale this year. Hi, I grow seakale commercially. No need to pull the plant in the fall. . just remove the sick looking or bug eaten leaves and cover the new bud with a black plastic bucket. ( black absorbs heat) I do this on New Year's day. As the ground warms in late Jan/early Feb the bud will sprout and when it gets to about 6 inches, cut it off with about a quarter inch of stem attached. The stem left in the ground will sprout again. . remove all the new shoots leaving the strongest to grow through the summer. Don't let it flower unless you want seeds. The shoot you cut needs to be eaten right away for the best flavour. Into a pan with butter or good olive oil and a little lemon juice to garnish. Don't overcook. . If growing from seed don't do the above till the second season. The fleshy root thongs make new shoots very easily, you can get many many new plants far more easily by lifting a mature plant and taking root cuttings. Enjoy!